Atrazine is one of the most used pesticides all over the world and it is frequently detected in surface water. 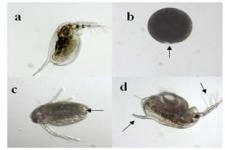 The aim of this study was to evaluate the effects promoted by environmental concentrations of atrazine on the embryo development of Daphnia magna. All the concentrations induced a percentage of embryo abnormalities upper than 78%. The profile of embryo abnormalities included effects in both stages of embryo development (gastrulation and organogenesis). At the lowest concentration (1 µg L-1) we noted the appearance of 20% of arrested eggs. This effect increased with the concentrations, which indicate the increment of the effects severity. Therefore, the maximum allowable concentration proposed for atrazine by the environmental quality standards (2 µg L-1) induce high toxic effects to the exposure embryos.